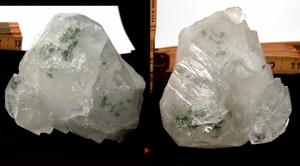 Here is a showy large quantum cluster with areas of green chlorite, several rare multicolor irises, and white chlorite in one side, too. It sends out amazing happy, confident energy! Large cabinet sized, 2x 4x 4-1/4". It features skeletal areas well worth peering into and an aggregate of smaller, doubly-terminated crystals in parallel growth of 1-1/4x 2". Record keepers, and regrowth-from-contact to its' back side - no damage. Self-displays handsomely three ways, or fills one's hand.